Cyclic diadenylate monophosphate (c-di-AMP) is a cyclic dinucleotide (CDN) produced by bacteria in which it functions as an essential second messenger . It coordinates bacterial growth, cell wall stability, and responses to stress and plays a crucial role in the establishment of bacterial infection. 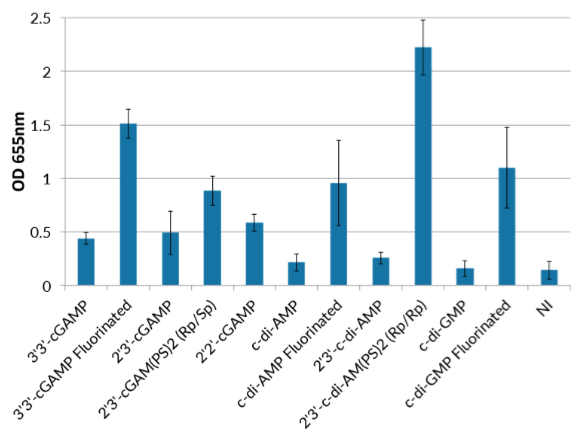 CDNs are a relatively new class of adjuvants that have been shown to increase vaccine potency . CDNs activate innate immunity by directly binding the endoplasmic reticulum-resident receptor STING (stimulator of interferon genes), activating a signaling pathway that induces the expression of interferon-β (IFN-β) and also nuclear factor-κB (NF-κB) dependent inflammatory cytokines [3, 4]. 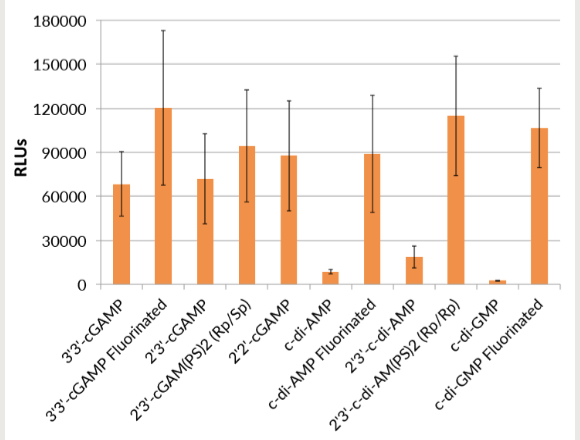 Recent studies have also demonstrated that c-di-AMP exerts strong adjuvant activities when delivered by the mucosal route [5, 6]. c-di-AMP VacciGrade™ is a preclinical grade preparation of the cyclic dinucleotide c-di-AMP. c-di-AMP VacciGrade™ is for research use only, not for use in humans. 1. Witte CE. et al., 2013. Cyclic di-AMP is critical for Listeria monocytogenes growth, cell wall homeostasis, and establishment of infection. MBio. 4(3):e00282-13. 3. Jin L. et al., 2011. MPYS is required for IFN response factor 3 activation and type I IFN production in the response of cultured phagocytes to bacterial second messengers cyclic-di-AMP and cyclic-di-GMP. J Immunol. 187(5):2595-601. 4. Burdette DL. et al., 2011. STING is a direct innate immune sensor of cyclic di-GMP. Nature. 478(7370):515-8. 5. Ebensen T. et al., 2011. Bis-(3',5')-cyclic dimeric adenosine monophosphate: strong Th1/Th2/Th17 promoting mucosal adjuvant.Vaccine. 29(32):5210-20. 6. Škrnjug I. et al., 2014. The mucosal adjuvant cyclic di-AMP exerts immune stimulatory effects on dendritic cells and macrophages. PLoS One. 9(4):e95728. c-di-AMP VacciGrade™ should be stored at -20°C. c-di-AMP VacciGrade™ is guaranteed sterile. Combined HDAC and BET Inhibition Enhances Melanoma Vaccine Immunogenicity and Efficacy.